Product code: ES8387 Categories: Art Deco, Art Deco Rings & Art Deco Engagement Rings. 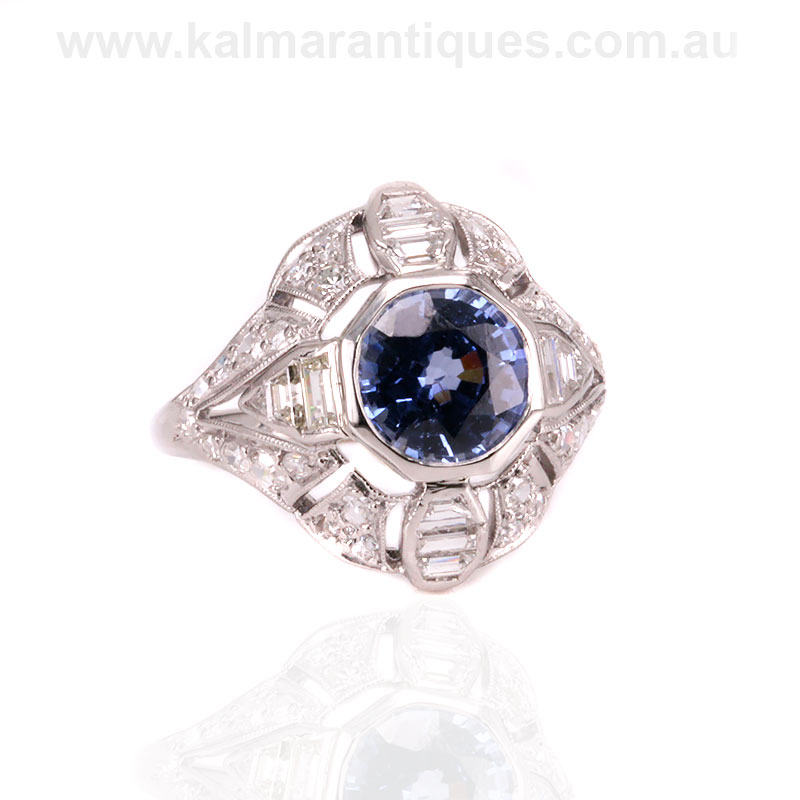 Here is a truly magnificent Art Deco sapphire and diamond ring from the 1920’s that is breathtaking and is destined to always be admired every single time that it is worn. Hand made in platinum, this ring exemplifies the wonderful geometric designs and super craftsmanship that is associated with jewellery from the Art Deco period and shows why it is as popular and highly sought after today as it has been since the 1920’s. Sitting proudly in the centre is a spectacular natural Ceylonese sapphire that measures 2.50 carats and it not only the most superb colour, but also clarity allowing you to see right through the stone. The quality of this sapphire shows why Ceylonese sapphires have been regarded for centuries as the finest in the world, and set in the pure white colour of the platinum and surrounded by the diamonds really accentuates not only the colour but also the size. There are a total of forty two diamonds in this ring with a combination of trilliant cut diamonds, trapezoid cut diamonds and baguette cut diamonds running down from al four sides as well as thirty single cut diamonds set into the other sections. All of these diamonds come together to total 1.06 carats and make this ring sparkle magnificently. Measuring 20mm across by 18.3mm, this ring sits so proudly on the finger and day or night will always get the attention and admiration that it so rightly deserves. 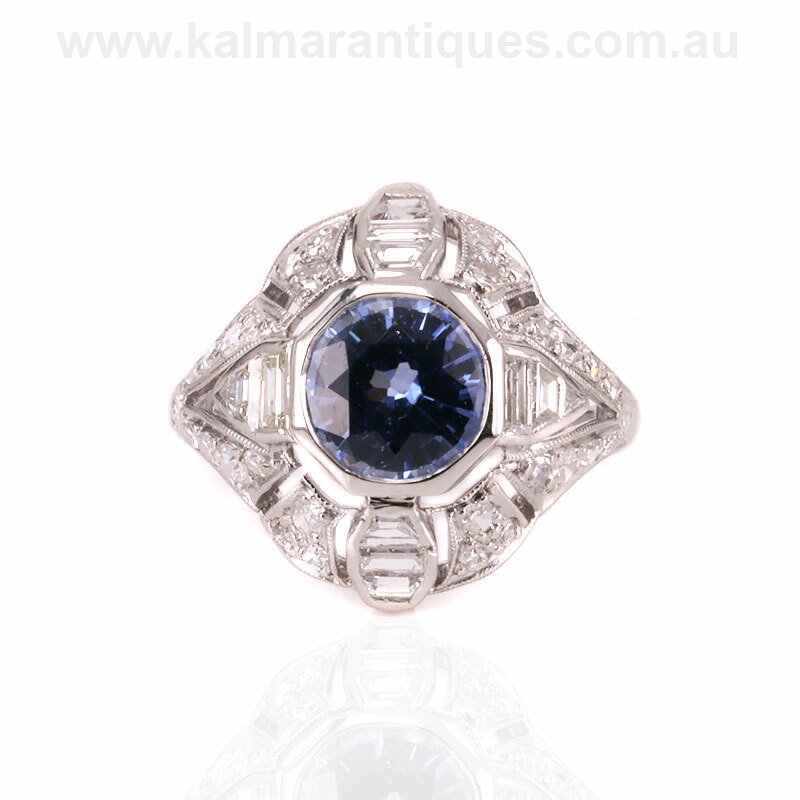 This Art Deco sapphire and diamond ring is set with a 2.50 carat Ceylonese sapphire. Regarded as the best in the world, the colour of this sapphire is spectacular. This ring was hand made entirely in platinum. Set with a combination of single cut diamonds, trapezoid cut diamonds, baguette cut diamonds and trilliant cut diamonds, they total 1.04 carats.